Decrease the sugar and calories by using part VitaFiber and part honey. Add all ingredients to a KitchenAid mixer or other high powered mixer and blend until smooth. Shape into bars. Bake at 320°F for 30 minutes. With the holiday season here, many Americans are faced with a very difficult decision: should I dive into that second serving of glazed ham and mashed potatoes delicately covered with a blanket of gravy or put the rest away for later? At this time of year, family and friends often gather together around the dinner table, sharing comfort food and stories while celebrating the holidays. But, let’s face the facts, many holiday foods aren’t the healthiest options. According to a recently published study, most Americans gain 0.5 kilograms, or about 1 pound, of weight during the holiday season.Overweight and obese individuals gain more than than those who are healthy weight. But, if it’s only 1 measly pound over the holidays, then what’s the big deal? While it seems that gaining 1 pound isn’t a big deal, the same study showed that most individuals don’t shed that pound over the next year. So over time those measly pounds tend to add up, increasing the individual’s risk for becoming overweight or obese. Does this mean that you can’t eat your favorite holiday dishes? Chips, creamy dips, fried cheese sticks, potato skins, buffalo chicken poppers, you name it. These tasty snacks are one of the biggest calorie-packing culprits during the holidays. If appetizers are on the menu, opt for fresh vegetables dipped in a light ranch sauce or whole wheat pita chips dipped in a low-fat yogurt dip. Plenty of flavor, fewer calories. This creamy dish is the quintessential holiday companion to any entrée, but many people make mashed potatoes with cheese, heavy cream, and plenty of butter. Try substituting the heavy cream for skim milk and chicken broth or roasted garlic for extra flavor while keeping the creamy texture of the potatoes. Potato Latkes are an essential part of every Hanukkah celebration, but these fried pillows of potatoes can really add a lot of fat to the holiday meal. Try mixing white and sweet potatoes to add extra vitamins and minerals to your dish. Also, make sure to use healthy oils such as olive oil to sauté the latkes instead of butter! While delicious, these creamy concoctions are typically filled with extra cheese, creamy condensed soups, and overcooked vegetables. Upgrade your favorite vegetable casseroles by substituting canned vegetables with frozen vegetables to decrease the sodium. Additionally, substituting some of the fried onions with slivered almonds keeps the familiar crunch while switching to low-fat cheese cuts out some of the fat and calories (or use less of a more flavorful cheese). Dessert during the holidays is definitely a must! A great way to cut the fat and the calories from your favorite baked goods is by substituting the oil with applesauce. Applesauce adds lots of moisture and becomes almost flavorless, making it a versatile ingredient. Making healthy choices during the holidays may seem like a sacrifice, but it does not have to be! 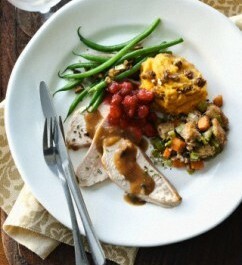 Done right, you can enjoy your favorite holiday comfort foods without packing on the calories or the pounds. Schoeller DA. The effect of holiday weight gain on body weight. Physiology and Behavior 2014;134:66-69. Almonds – These power-packed nuts are sure to fuel your work day with plenty of protein and heart-healthy fats. A one-ounce serving (about 23 raw almonds) will only set you back 164 calories and provide you with 6 grams of protein. In Shell Pistachios – Preliminary behavioral studies suggest that you may consume fewer calories if you opt for in-shell pistachios versus those already shelled because it takes time to break them open and the shells are a visual reminder of what you’ve eaten. Wonderful Pistachios 100-calorie snack packs make a great on-the-go snack that conveniently helps control your portions. Looking for flavor and maybe even something a little sweet and spicy? 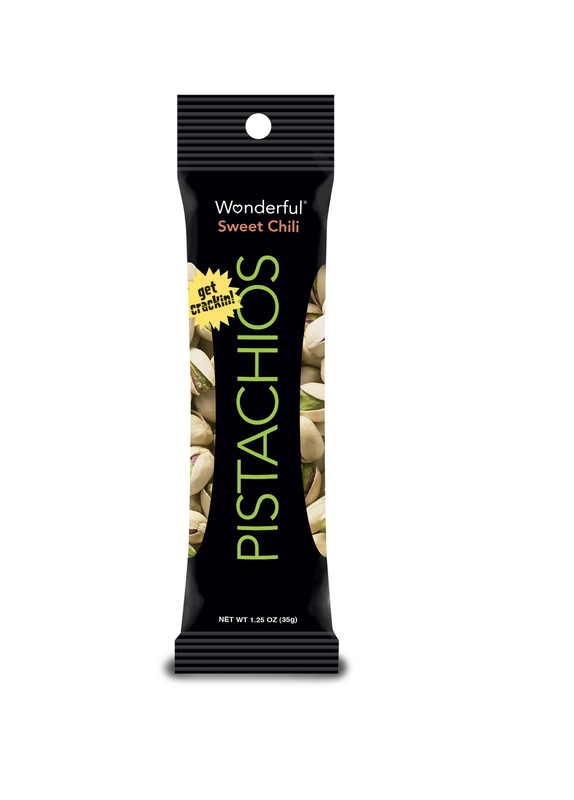 Try Wonderful Pistachios Sweet Chili*. Preliminary behavioral studies suggest that you may consume fewer calories if you opt for in-shell pistachios versus those already shelled because it takes time to break them open and the shells are a visual reminder of what you’ve eaten. Wonderful Pistachios 100-calorie snack packs make a great on-the-go snack that conveniently helps control your portions. Looking for flavor and maybe even something a little sweet and spicy? Try Wonderful Pistachios Sweet Chili – the secret is in the spices. Salt and pepper has just the right touch of spices to deliver a peppery bite. If you are worried about the calories in nuts, fear not. Read more about how nuts can help you live longer and lose weight. A childhood favorite, this snack not only brings out your favorite memories, it also gives you a great protein-packed snack to keep you satisfied ‘till lunchtime. Cut a small stalk of celery in half, then lengthwise to give you four halves of celery. Divide one tablespoon of peanut butter and one tablespoon of raisins into each of the celery halves. This tasty, fun snack stacks up to only 124 calories and 4 grams of protein! Looking for a more savory snack? Pack a 1-oz slice of deli turkey and a slice of your favorite low-fat cheese for a dose of 12 grams of protein to keep you full, 200 mg of calcium for bone health, and a measly 145 calories! Ever heard of edamame? Don’t worry, it is just a fancy word for green soybeans. Steam ¾ cup of these shelled soybeans with a sprinkle of garlic powder for a tasty treat that only sets you back by about 140 calories. And don’t worry, with 13 grams protein and 6 grams of fiber, this snack will be sure to keep your belly happy! Hummus is a food trend that is really sticking; it is a great, healthy snack that is inexpensive and flavorful. So, what exactly is it? Hummus is a Mediterranean dip made of ground chickpeas and spices. Try dipping your favorite vegetable in it, such as baby carrots, sliced cucumbers, or sliced bell pepper for a nutrient-dense snack. At about 100 calories, 2 tablespoons with a handful of your favorite dip-able veggies are a fresh way to keep you going. Also check out edamame hummus – it’s simply amazing (Trader Joe’s has one or make your own). This rich, creamy snack will help quell your stomach and hold you over. Toast one 100% whole wheat slice of bread and top with 1 tablespoon of your favorite peanut butter for 160 calories, 8 grams of protein, and 3 grams of fiber. Popcorn is a fun, easy-to-eat snack that gives you more bang for your calorie “buck”. For a whole 3 ½ cups of plain popcorn, you’re getting 4 grams of fiber and only about 100 calories. Word of caution: try to avoid the buttery or sweet popcorn flavors as those have more calories and sodium in them! Want a change from a plain cup of strawberries? Dip some berries or 1 cup of your favorite fruit in ½ cup of low-fat or fat-free Cool Whip for a light and fresh 100-calorie snack. Or try mixing higher protein cream cheese with a little cheesecake flavored cream cheese and spread this on sliced strawberries or pipe it into hulled strawberries. Fuel up with this creamy treat that won’t weigh you down. Top ½ cup of fat-free vanilla yogurt with 2 tablespoons of your favorite low-fat granola and ½ cup of fresh blueberries (or ½ cup of your favorite fruit). This fun snack is nutrient-packed with 7 grams of protein, plenty of calcium for strong bones, and only 200 calories. 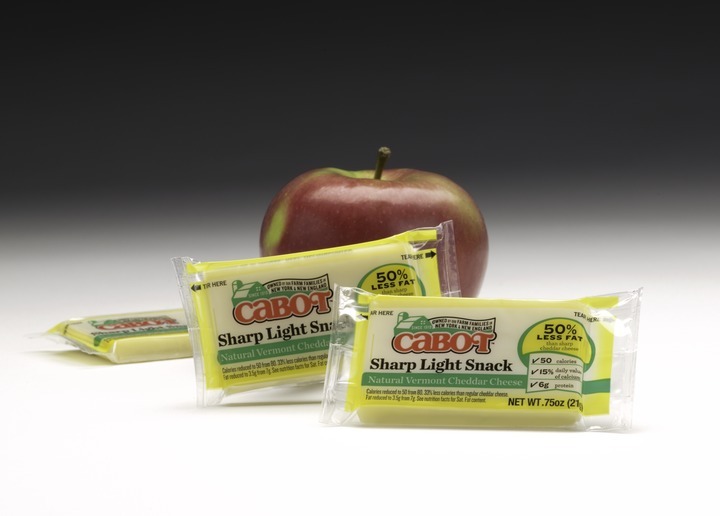 Cabot Snack Size. Because everything is better with cheddar! 10. Cabot snack size*. Individually pre-wrapped cheeses can be kept out for hours and they are a great nutrition-rich (protein, calcium and more) snack to tie you over until your next meal. Find them at Wegmans, Costco and Acme. U.S. Department of Agriculture, Agricultural Research Service. 2014. Snacks: Percentages of Selected Nutrients Contributed by Food and Beverages Consumed at Snack Occasions, by Gender and Age, What We Eat in America, NHANES 2011-2012. U.S. Department of Agriculture, Agricultural Research Service. 2014. Snacks: Distribution of Snack Occasions, by Gender and Age, What We Eat in America, NHANES 2011-2012. United States Department of Agriculture. Supertracker. Internet: https://www.supertracker.usda.gov/foodtracker.aspx (accessed 5 November 2014). I get quite a few questions from parents who ask what they can feed their kids to keep them fueled for sports yet happy at mealtime. After all, no parent wants to hear their child complain at mealtime (or stubbornly sit at the table for hours like I did, refusing to eat my peas). So expert dietitian Leah Holcombe put together this fantastic document with several ideas for kid-friendly lunches. Healthy Lunches for Kids with kid-friendly lunch ideas. Oatmeal with low fat milk and a spoonful of almond butter or peanut butter. Bob’s Red Mill is minimally processed and has a chewy, nutty flavor. (personally, I’m a big Quaker fan but I’ll try Bob’s one day!). Greek yogurt. If you need it sweet, buy plain yogurt and drizzle a little honey on top or mix in a little bit of jam. Add granola or walnuts for crunch or or Yogi granola chips. Edamame with a side of red grapes. Cook the edamame (it takes 5 minutes max and it is a great source of fiber and protein) and sprinkle a little sea salt on top. Pair it with red grapes for a sweet & salty combo. Trail mix. Make it yourself or pick up a bag of healthy trail mix. 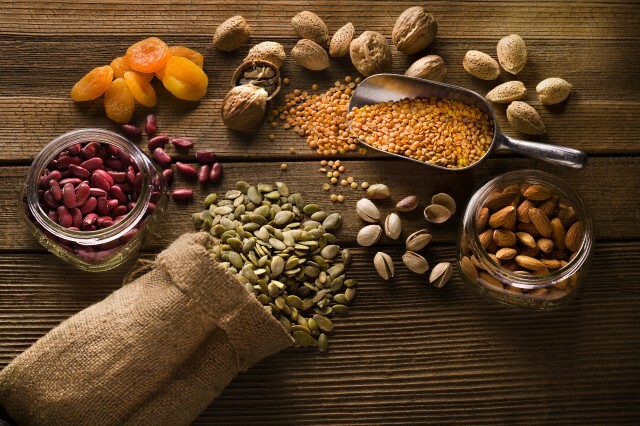 If you are a DIYer, mix together an equal amount of dry roasted almonds, pumpkin seeds (great for magnesium), dried cranberries and golden raisins. Add any other nuts as desired. Whole grain cereal. If you are concerned about your vitamin & mineral intake, add a little cereal to your nutrition plan. Most cereal is fortified and whole grains are a great source of antioxidants and fiber. My new fav: KIND Healthy Grains. Mini toasts with goat cheese and sliced pears. Try spreading an oz or two of soft goat cheese on several whole grain Melba toasts with thinly sliced pears for a tangy, salty, crunchy snack. Guacamole (or salsa) with chips. Avocados are loaded with fiber, vitamins, minerals and healthy fats so pairing guac with whole grain chips works well (if you are worried about portions, check the individual servings of guac in some stores – I found these in Target). Hummus and Sweet Bell pepper. Try slicing a red, yellow or orange pepper for a sweet flavor and pair it with hummus. Tribe original or, I love Sabra with roasted pine nuts! Warm soup (many come in low sodium varieties) with 3-4 whole grain melba toasts. Try V8 butternut squash soup – great for the Fall and Winter! Crackers and cheese. Kashi whole grain crackers with Laughing Cow cheese – a delicious combo! Graham crackers with a spoonful of ricotta. Spread the ricotta on and drizzle honey on top if you really want to up the sweet ante. Jell-O Sweet Temptation French Silk chocolate pudding with a handful of raspberries (this time of year you can thaw frozen raspberries very quickly on the shelf or in the microwave). Sandwich thins with a spoonful of Nutella and sprinkle of peanut butter chips. Place under the broiler for 1 minute and melt. Core a red apple and place it in a microwave bowl. Cook in the microwave for 1-2 minutes to soften. Add a spoonful of peanut butter into the middle and zap again for 45 seconds. Dig in to your mini apple-peanut butter pie! Kettlecorn with cinnamon and sugar (DIY) or Popcorn Indiana’s version (their holiday one drizzled with chocolate is so good!). Banana frozen yogurt DIY. Add 2-3 frozen bananas (chopped) into a blender with 1/2 cup lowfat milk. Add 3/4 cup ice and blend until smooth. Add chocolate chips or granola for a topping. Chopped figs with brie cheese on whole grain crackers. A little messy but it sure is good! And there are two more I’ll add since I am frequently dashing through airports – I love KIND bars and Clif Builder Bars (and mixed nuts as well as cereal in a ziploc). Portable, easy and TSA approved! Thanks Sara! I can’t wait to try these ideas myself!